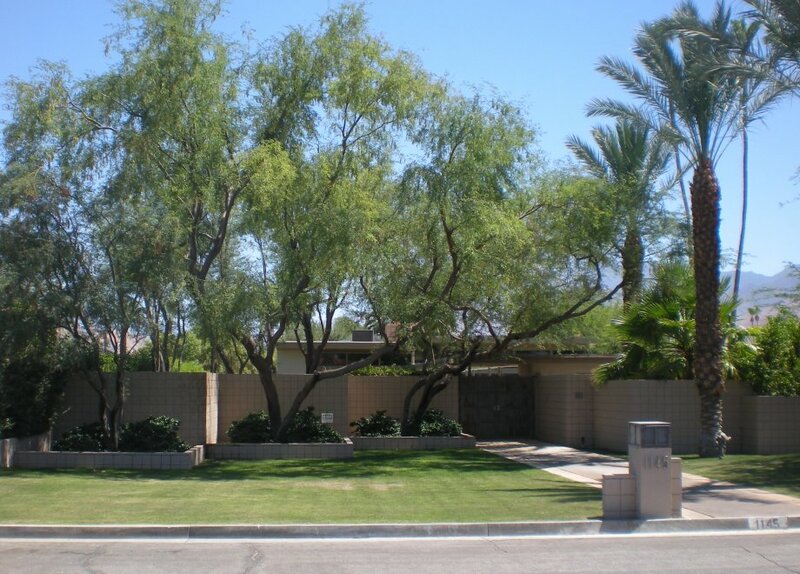 Frank Sinatra’s Palm Springs home, Twin Palms, was built in 1947. 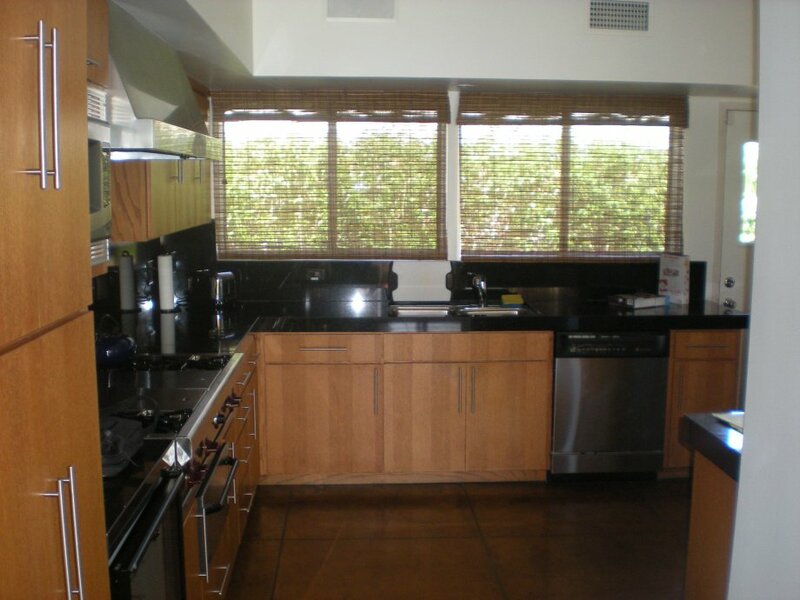 The kitchen in this mid-century modern gem originally featured St. Charles kitchen cabinets, but at some point over the past 60 years, folks removed the original cabinets. Today Retro Renovation is first online to showcase the all-new St. Charles kitchen cabinets that were installed in Twin Palms as a collaboration between St. Charles and the previous owners. This is not a period restoration. The house today is used for rentals, photo, film and TV shoots and special events, so it needed to have that flexibility. And, St. Charles is owned by the Viking Range Corp., so as you’d expect, it features those top-of-the-line, commercial-style products. To be sure, the update/backdate shows the relevance and adaptability of mid-century classics like steel kitchen cabinets to today’s kitchens. Read on for before and after photos of the Twin Palms kitchen, along with an interview with the kitchen’s designer, Andy Tobias. To launch the slide show, click on the first image. Use the arrows below the captions to move forward. What were you trying to accomplish with the new kitchen… what was the design intent? Because this was a restoration/renovation project, the design goal was to create a kitchen that had all the modern amenities but would feel like it belonged in the house. The color palette selected for the cabinetry was a soft blue/green color called Sea Glass. This color complemented the rest of the house and was a color that would have been used at the time the house was built. Most importantly, the Sea Glass color brought the palette of the outdoor living space into the home. The kitchen was designed around some existing conditions such as ceiling duct work and the inability to move plumbing, so the footprint of the kitchen remained very true to the original design. However, with the addition of glass doors and open cabinets, a lighted shelf and the elimination of a pony wall, the newly designed space feels much more open and bright. Why did you choose St. Charles cabinets? I have worked with St. Charles Cabinetry for years and was brought on to the project after the brand had been selected for the space. With a long and very prestigious history, St Charles Cabinetry was a natural fit for this house. True to the original kitchen, St. Charles cabinets were used when the house was first built. Historically, it’s a great choice and, from a design perspective, the clean-line design of the cabinetry is a perfect complement to this mid-century modern home. 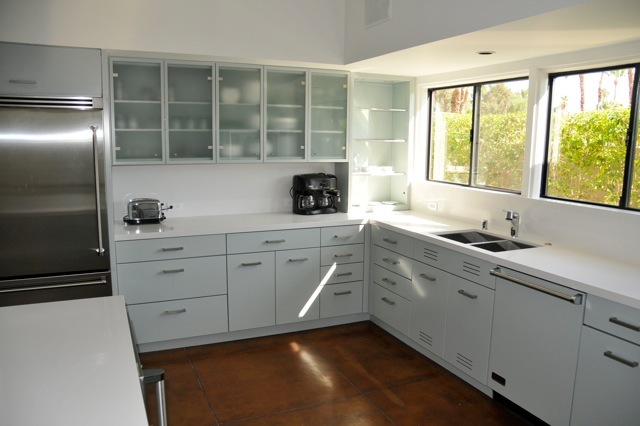 Additionally, metal cabinets do not have the same expansion and contraction properties as wood, so in a dry climate such as Palm Springs, the product will perform perfectly and look great forever. 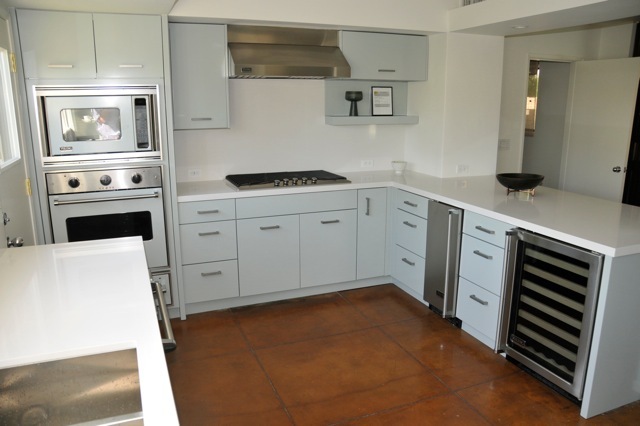 Is this your first experience working with steel cabinetry? What do you think of them? No, I have been a fan of St. Charles for many years and I love them! They are environmentally friendly being made with 98% recyclable content. With a choice of either stainless steel or powdercoat finish options, there is no material waste going into the atmosphere or “down the drain” during the finishing process. The product has state-of-the-art components and is engineered for performance and durability. These cabinets are beautiful to look at, offer a wide range of interior accessories and design choices, and with 23 colors to choose from, lend themselves well to any project. 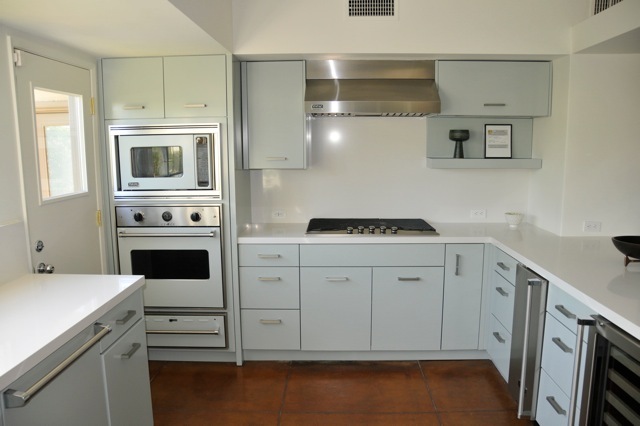 What do you think about the resurgence of steel cabinetry (including vintage) and its appropriateness for today? 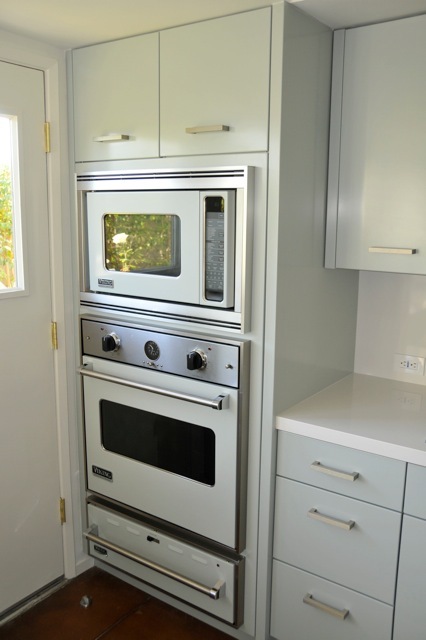 I think the resurgence of steel cabinetry makes perfect sense because it’s very environmentally friendly and durable. The new line of St. Charles Cabinetry, now a division of Viking Range Corporation, gives homeowners both a contemporary look as well as timeless appeal that many designers and homeowners are looking for. The additional benefit of St. Charles is the modern performance updates in terms of hardware and finish function. There are many homeowners still enjoying vintage St. Charles cabinets installed decades ago, which proves that they stand the test of time. Can you give me a specification list? What did you use for: cabinet color, appliances, sink, faucet, cabinet pulls, lighting and oh – the countertop. Okay, big question, how much did the cabinets cost? Individual projects costs are typically not disclosed. We can confirm that St. Charles Cabinetry is priced similar to premium-custom cabinetry brands, and the company works with homeowners to customize cabinetry to fit the family’s budget. Why no paint or wallpaper (we love wallpaper – a googie design from Bradbury & Bradbury would be fabulous!)? We worked with the homeowner and the interior designer for the rest of the space, and kept the kitchen clean and minimal – similar to how it looked in the past. Typically in the kitchen, I prefer to recommend a backsplash material of tile or stone, because it’s easier than wall paper to keep clean. What was the hardest thing about this project? What was the most fun thing? In keeping with the home’s original footprint, we were working with some pre-determined spacial constraints. The benefit of using St. Charles is that it is custom cabinetry, so you can configure it to fit the space you need. Because the space was small, we used multiple glass door options for the wall cabinets. We also utilized the St. Charles lighted shelf accessory for the range wall to help give the space a “lighter” feel. Ultimately, I think the space turned out beautifully and blends with the aesthetic of the rest of the home – both inside and out. The best part of working on this space for me was the history of the house. 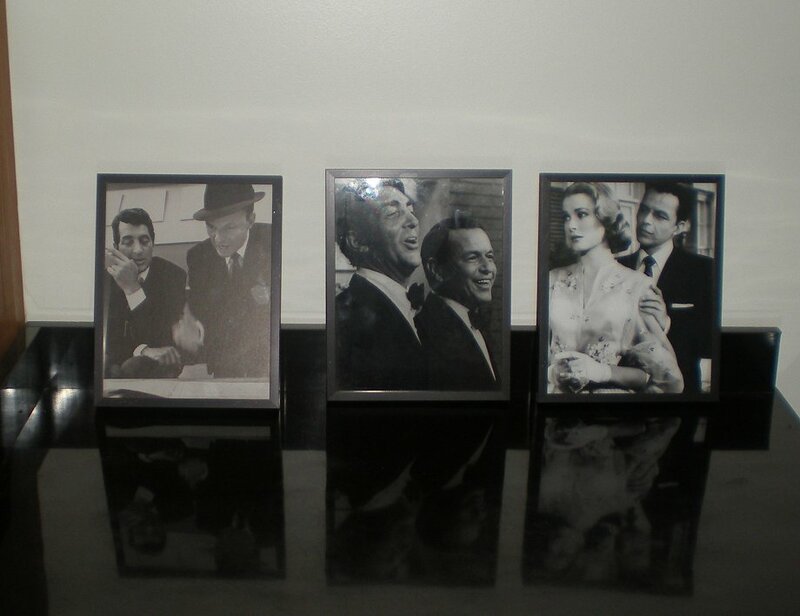 In my mind I was designing a kitchen for Frank Sinatra and Ava Gardner – how fun and special is that? Tell me about yourself – and why you were chosen for the job. 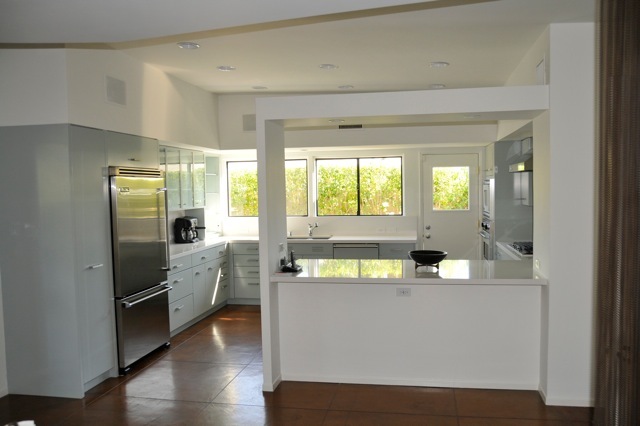 Thanks to Andy for the Q&A — and for the gorgeous kitchen that would make Ava Gardner proud. And, thanks to St. Charles (thanks, Keri!) for providing the photographs for this story and the opportunity to feature this wonderful retro renovation tale! 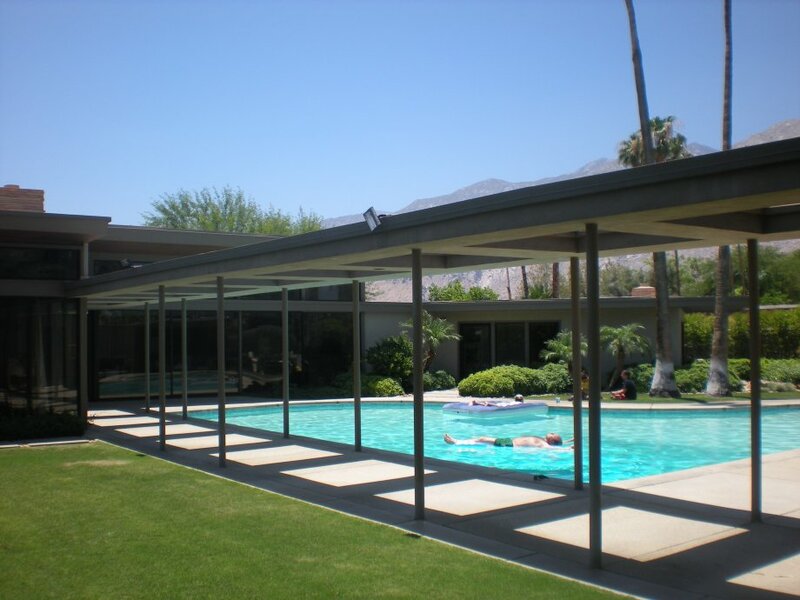 Twin Palms – Original Desert Estate of Frank Sinatra — go to their History and Then & Now slide shows for some great vintage photography. I cannot feature the photography on this blog due to copyright issues. I went to the St. Charles website but didn’t find any pricing information. I live in a 50’s ranch with original metal cabinets in the kitchen and would love to replace them (they were not well cared for) and still have metal cabinets and the same retro feel. Do you have any other information on the cabinets? Jennifer, like other high-end cabinet companies, they won’t give out pricing. I really really dislike that business practice — so lacking in transparency, which is the new consumer watchword. Alas. So, you have to go to a retailer and talk to them… Also be sure to check out the Forum, which is all about connecting buyers with sellers of vintage steel kitchen cabinets. We’ve identified 70+ brands so far. It’s a real retro-wonderland: https://retrorenovation.com/forum/ Good luck. I use to install st. charles steel kitchens back in mason city iowa quit a few years ago the were made to last a long time its gives me great pride that the continue makeing them . I tryed to find st charles st. kitchens in our yellow pages no luck thanks to the computer I found them again ! Great kitchen … I’m not usually a fan of cooler colors in the kitchen, but the sea glass color really suits that space and the kitchen has a lovely feel to it. Being a musician, however, it’s the PIANO POOL I really love! THAT is opulence and decadence I will probably never experience in my modest little home but I love that someone had a pool like that made. Maybe a ukulele shaped gold fish pond would be more realistic? ?